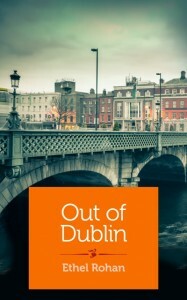 The memoir contains painful details of life growing up in Dublin and the struggle to leave – and the reader knows from the opening that there will be wreckage along the way. Even at a young age, with five dynamic siblings and two complicated parents, the small version of Ethel has difficulty finding her place. She’s a girl searching for her song, trying to be heard. But she’s also a girl with unremitting devotion to her family. And this duality permeates the memoir: a desire to understand where she fits in a complex and painful family history, and the dedication of a daughter who loves her parents and family, flawed as they are. The writer is frank about the tough things: violence, abuse, anger, secrets. But a tenderness persists as well, amidst layers of confusion and disorientation. Straightforward language and subtle affection make this a small splendid thing. At 10,000 words, this memoir is a glimpse at a whole life. In this way it’s not unlike flash fiction. And like Rohan’s short fictions, this story captures something large in a very small space. It is paced with alternating tempi, like life itself: sometimes the narrative lunges forward at break-neck speed and sometimes it offers up quiet moments that linger long after the reader has passed them by. Near the beginning there is a sequence that races at you, a 440-word sentence that could be an independent piece of flash fiction all its own, recollecting childhood beach trips in a Morris Minor, complete with sandy sandwiches, surfside swimming and ice cream treats – but much more than that because the sandwiches are sandy (“granules cracking between our teeth”), the swimming is competitive and “pretend” and the ice cream treats come with a side of nicotine and hard liquor. There’s also a hint of blindness on a bright summer’s day, darkness coming fast. Woven into this recollection of a family together is a story speeding to its inexorable doom. The details in this passage are carefully placed yet relentless – necessary and urgent. The memories captured here come in a flood, as if it’s important to pour it onto the page, before they are lost, like sand slipping through one’s fingers on a hot afternoon at the shore. The “I” is alone, already scattered to the universe, willed away from her roots. The “I” is fragmented, as are the sentences. Small breaths of life. And the “I” struggles throughout the story – moving forward and making connections back. The individual frees herself in ways she can, even using geography to her advantage, but the devotion and honour for her parents and home is never broken. Rohan does justice to her story by knowing how to pace it, how to share, what to tell, what to leave out. Like excellent flash fiction, this very short memoir holds back in all the right places and explodes with enough detail to paint a whole picture. The reader is left with an impression of an entire life, spanning oceans and continents. A life spent contemplating fragments from wreckage and enduring connections. Rohan opens the book with a small note: Women, burn bright. The specific details make this her story alone and yet it holds a universal message. But the theme of light in darkness is handled so subtly that it avoids cliché entirely – and I even hesitate mentioning it here for fear of diminishing its brilliance. But this review would not be complete without coming back to how light penetrates the story in ways that are both truthful and clever: glittering light in houses on a San Francisco hill, starburst, fireworks and the image of an Xray showing bones against a dark background – a symbol, in the author’s words, of escape. The Xray brings us back to the beginning of course: bones. Bones that get broken. Bones that are so fragile they sometimes don’t heal wholly. And bones that hold a body together, despite the fractures. This is a story one writer needed to tell. It bursts with urgency, written within a year of the passing of the writer’s parents. It had to be a hard one to write. But it’s a story I’m glad to carry with me. I’m not glad for the hard parts, but for the way Ethel Rohan shares her story. It is art. It is truth. Michelle Elvy lives and works as a writer, editor and manuscript assessor based in New Zealand. She edits at Blue Five Notebook, Flash Frontier: An Adventure in Short Fiction and Awkword Paper Cut, where she also curates a monthly column, Writers on Writing. She is also Associate Editor for the forthcoming Flash Fiction International (W.W. Norton, 2015). More at michelleelvy.com, Glow Worm and Momo, her compact traveling home.